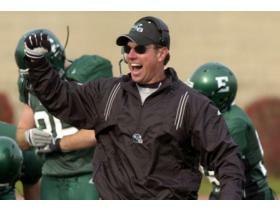 Nov. 24, 2008 · 4:40 p.m.
Eastern Michigan fired head coach Jeff Genyk today, in his 5 seasons the Eagles were 15-42 overall and 12-26 in the Mid-American Conference. After losing at Temple last week, the Eagles fell to 2-9 overall and 1-6 in the MAC. Only in 2006, at 1-11 and 1-7 did Genyk and the Eagles have fewer wins. Genyk will coach the final game of the season Friday afternoon against Central Michigan at Rynearson Stadium. "Winning consistently in football has been a challenge for our institution long before the arrival of coach Genyk. Eastern Michigan Athletic Director Derrick Gragg said. “I credit coach Genyk and his entire staff for working tirelessly in attempting to improve our program," Gragg added, "but, we have not met our aspirations for football. The best season under Genyk for the Eagles was 2007. He led them to a second Michigan MAC Trophy, beating both Central Michigan and Western Michigan that season. Ending the season tied for 3rd place in the west division. According to Gragg, the search for the new coach will start immediately. Former University of Michigan coach Lloyd Carr will be an unpaid adviser on the selection. Gragg was a compliance director at Michigan from 1997-2000.